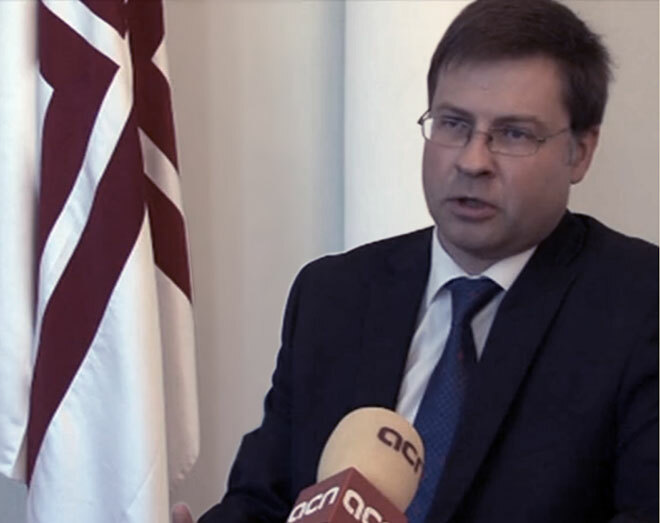 In an exclusive interview with the CNA, the Prime Minister of Latvia, Valdis Dombrovskis, stated that the ‘Catalan Way towards independence’ human chain is a “powerful signal” that is “worth paying attention to”. He was referring to the 400-kilometre human chain requesting independence from Spain, which spanned Catalonia from north to south on Wednesday and finally gathered 1.6 million people according to the Catalan Police. It was based on the ‘Baltic Way’ that took place in 1989 when Lithuania, Latvia and Estonia were calling for independence from the USSR. When asked if Riga would recognise Catalonia if it were to become independent, the Prime Minister stated “if there is legitimacy in their process, then I would say, theoretically, why not”. The Latvian PM believed that we should “look at options” on how to successfully resolve the demands for independence. If the Spanish Government refuses the referendum to take place, some voices suggest that Catalonia should perform a unilateral declaration of independence, which according to Dombrovskis would be “more complicated”, although he does not rule out the possibility of its success. He also spoke of the problem of how Scotland and Catalonia – if they were to gain independence – would enter the EU as “the issue” has not been “worked on with a sense of urgency” yet. However, he admitted that some discussions have already taken place at EU level about what would happen if a territory of a Member State secedes, but a final decision has not been taken yet.